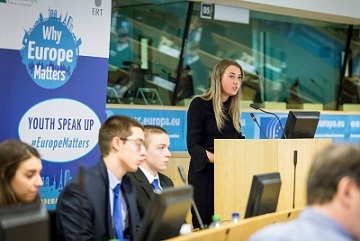 The final event of the ‘Why Europe Matters‘ campaign took place on 21 March at the European Committee of the Regions in Brussels. The occasion – held under the patronage of the Bulgarian EU Presidency – was designed to foster the dialogue between young Europeans, policy-makers and business representatives. Lilyana Pavlova, the Minister for the Bulgarian Presidency , opened the event, alongside Karl-Heinz Lambertz, President of the European Committee of the Regions.“Young people have a central place in the debate about Europe,” he said. The discussion was based on the findings of an online survey including 4500 respondents from 31 countries. Questions covered the issues presented in the Rome Declaration and its main results include key priorities identified by young people for the future of Europe: quality education, youth employment and a safer Europe. Key conclusions to be drawn from the survey include: young people feel their voice not heard (82%); they identify the most important benefits from the EU as peace and mobility; young people with entrepreneurship education experience have a – higher knowledge of the EU and are more optimistic about the future. After the presentation of the survey results to a wide audience, six teams of young Europeans from nine different countries presented their concrete proposals for a better Europe. For instance, young people came up with some innovative solutions on how to develop mentoring schemes for young people, to establish a European foundation to support start ups, to implement specific workshops to integrate migrants, to embed entrepreneurship education programmes in schools and universities as well as to create an educational cybersecurity team within ENISA to raise citizens’ and companies’ awareness. The team pitches were enriched by numerous interventions from policy-makers and business representatives. The event closed with the intervention of the Commissioner for Youth, Sport and Culture, Tibor Navracsics. “I’m working to help boost youth participation in civic & political life, such as in the upcoming European elections in 2019. I count on young people to make the most of this!” he concluded. JA Europe is Europe’s largest provider of education programmes for entrepreneurship, work readiness and financial literacy. In 2017, we equipped 3.5 million students in 40 countries with the knowledge, skills and attitude they require to start a business or get a job. JA works with the education and business communities as well as governments to provide young people from primary school to university with experiences that build the skills and competences they will need to succeed in a global economy. JA Europe is the European Regional Operating Centre for JA Worldwide®. The European Round Table of Industrialists (ERT) is a forum bringing together around 50 Chief Executives and Chairmen of major multinational companies of European parentage covering a wide range of industrial and technological sectors. Companies of ERT Members are widely situated across Europe, with a combined revenue exceeding € 2,250 billion, sustaining around 6.8 million jobs in the region. They invest more than € 50 billion annually in R&D, largely in Europe. ERT advocates policies at both national and European levels, with the goal of improving European competitiveness, growth and employment.